The Eagle’s Nest Mine in California is famous for consistently producing high-grade crystalized gold. 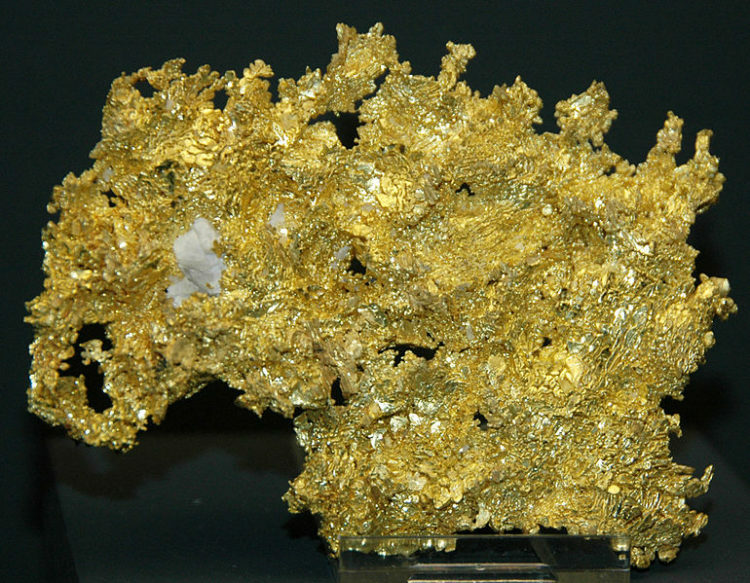 Much of the specimen crystalized gold sold in the United States has either come from the Eagle’s Nest Mine or the Round Mountain Gold Mine in Nevada. Before 1982, there were several claims in the Michigan Bluff mining district in Placer County that produced these specimens. Later these were bought and consolidated into the current Eagle’s Nest Mine. Specimens of crystallized gold are extremely rare. 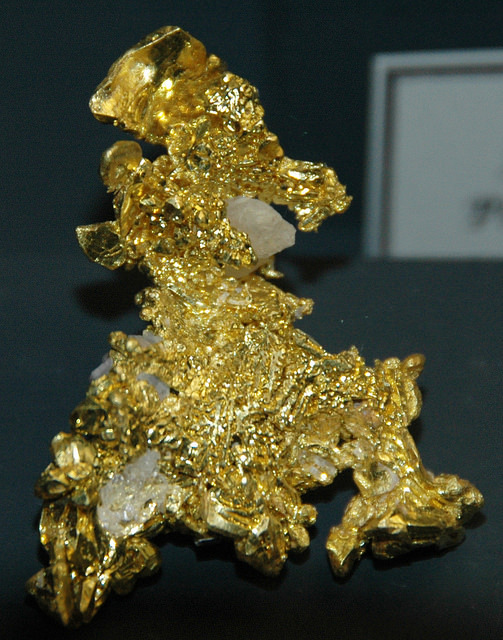 Although California is probably the largest producer of crystallized gold in the world, this type of gold only occurs in small pocket mines such as the Eagle’s Nest Mine. Since it is extremely rare, crystallized gold specimens are valuable collector’s item, far removed from the actual spot price of gold. Crystalized gold specimens can occur in a variety of different types including These include cubic and octahedron structures, leaf crystal gold, dendritic formations and as wire gold. The most abundant form of crystal gold found in the Eagle’s Nest Mine are the dendritic and Leaf gold. Distorted and modified octahedrons specimens have also been found in the mine. Gold mining in the region dates back to 1848 following the discovery of gold at Coloma which is less than 20 miles from the Eagle’s Nest Mine. When news of gold discovery in California first came out hundreds of thousands of miners flocked the area around Coloma in search of gold. While many of the early arrivals were unable to find a place to lay a claim of their own in Coloma, most of the latecomers begun exploring the nearby areas in search of gold. This is what led to the discovery of rich placer deposits near what is the modern day Eagle’s Nest Mine. The town of Michigan was established in 1850 to supply the miners mining the river. This town was abandoned in 1858 due to erosion that carried the land into the river. It was moved uphill and renamed Michigan Bluff giving rise to Michigan bluff mining district, home of the Eagle’s Nest Mine. The placer gold on the river played out in the 1870s and the production from the region dropped significantly although mining continued into early 1900s. 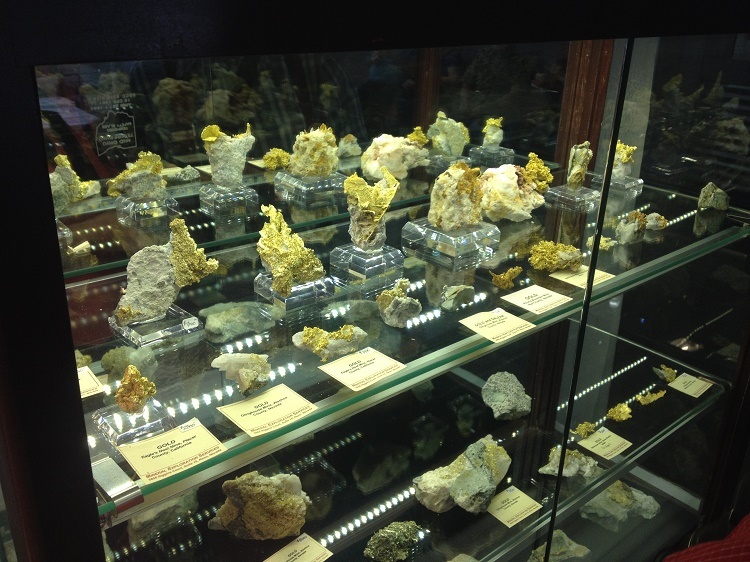 Big crystalline gold specimens for sale at the Tucson Gem Show. Many of these are from the Eagle’s Nest Mine. Lode Mining in Placer County and specifically the Michigan Bluff district began in the 1850s, although did not amount to much at first. The early miners in the area mostly focused their efforts on the rich placer gold in the river gravels. This was truly one of the richest mining areas in the US. Much of the lode gold was found in small pockets that could not support commercial mining. Keep in mind that during that time there was no concern about the shape of the gold. Crystalline gold wasn’t worth any more than any other gold… it was all melted down. The earliest reports of crystal gold mining in the Michigan Bluff district is contained in a report by William F. Blake contained in the American Journal of Science (1855). The report states “…interesting octahedral crystals have been found in the claims… about 2,500 feet above the level of the river.” This explains the presence of these crystal gold deposits in the Michigan Bluff Mining district. These early lode discoveries in the Michigan Bluff Mining district were often overshadowed by the richer placer miners along rivers and creek. The use of hydraulic mining made placers more productive and thus they got nearly all the attention. The mining of crystallized gold specimens from the Eagle’s Nest Mine came to the attention of the world in 1982 when Leicht wrote a small article titled “What’s New in Minerals” in the Mineralogical Records. Prior to this time most of the specimen from the mines were simply labeled from Michigan Bluff Mining District in Placer County. This helped to increase interested in the specimens from the mine prompting the owners to purchase several other mining claims in the area. Today the Eagle’s Nest mine is made up of several gold claims consolidated under one name. The Mine in recent years has produced a substantial amount of crystallized gold specimens for collectors. The Michigan Bluff Mining District which is home to the Eagle’s Nest Mine lies at the junction of two important tertiary channels. To the north there is the intervolcanic channel and to the south lies the pure quartz channel that is rich in gold and is characterized by many boulders. Because of the fusion of the two channels much of the gold in the district in course and often in form of crystals. Most of the bedrock in the district is schist and slate with small gold-quartz veins. The gold in the Eagle’s Nest Mine occurs in narrow near the surface quartz veins that also contain arsenopyrite and pyrite. In some of the veins, most of the carbonaceous rock has been eroded leaving crystalized gold loose within the fragmented veins.